In my attempts to experiment with technique and style and to bring about India's culture and heritage I create real images, where the landscapes are almost photographic and evoke cherished memories. Although the images may seem familiar, I try to morph them into forms that one might dream of. Through my paintings I convey a sense of freedom and free will that every child and person in the country should have. I try exhibiting the true spirit of life through children who hold their future and their mind in free, open and diverse hands. 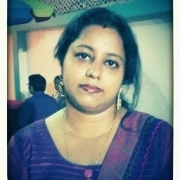 Tania Ukil, who is from West Bengal, holds a BVA (Western Painting) degree from the Government College of Art & Craft. She is known for her excellent art work that include Abstract, Landscapes and Figurative art using acrylic on canvas. Her paintings have a quirky artistic blend for the contemporary world and leans towards life and its mysteries.